The Fearsome 5 are a group of young Yoshis who live on Lavalava Island. The Fearsome 5 have only appeared in Paper Mario and are renowned for their mischief. As their name implies, the Fearsome 5 are made up of five Yoshi Kids, each one a different color. The Fearsome 5 are very good friends and are constantly found together, save for when they perform their seemingly common action of playing hide and seek. They are also very mischievous and rebellious, which causes great dismay and stress for their strict babysitter Sushie. The Fearsome 5 are found in the area of Yoshi's Village nearest to Jade Jungle and Mt. Lavalava, sharing their area of residence with Yoshi's Cabana and the local Toad House. If talked to initially, they would all reveal vague notions of mysterious plans they were apparently going to put into action shortly afterward. Indeed, if Mario was to walk to the ledge overlooking Mt. Lavalava's entrance and return, he would find Yoshi's Village in chaos, eventually learning that the Fearsome 5 had somehow managed to sneak into Jade Jungle to play hide and seek. The Village Leader would then persuade Mario and his partners to look for the Yoshi children, a request which Mario complied with. After some searching, the crew eventually found Sushie (who, while looking for the wayward Fearsome 5, had fallen into one of their traps) caught up a tree; after learning that Mario, too, was searching for the Fearsome 5, she decided to temporarily join his party as to double their progress. (Later on in the game, she would make her membership to Mario's party permanent.) The two then continued searching, eventually saving all members of the Fearsome 5 from the various jungle trials they had fallen to. (The only Fearsome 5 members who had not befallen some sort of life-threatening trap were the blue and purple ones (having simply gotten lost in the jungle and fallen asleep in a tree, respectively), who even still realized the error of their ways and regretted past decisions.) In the end, each member of the Fearsome 5 decided that it would've been wiser to have respected Sushie's past orders and ended up traveling back home. Even though all of the five but the purple one were petrified during their experiences in Jade Jungle and initially thankful to Mario for saving them, the Fearsome 5 seemed completely unaffected by their past ventures afterward. They acknowledged their punishment and seemed to have abandoned all plans of returning to the jungle (despite the fact that they did indeed travel back to it during Paper Mario's ending sequence, as is elaborated on below), but they continued to seem mischievous and even bragged about their adventures, still believing Jade Jungle to be exciting. Later, Mario and Parakarry can deliver a Letter to the Red Yoshi Kid member of the Fearsome 5 from Dane T., his apparent pen pal. This Letter is an invitation to the Red Yoshi Kid to come to Toad Town and go on an adventure to Boo's Mansion with Dane T. and Mini T. and also includes instructions on how to play a new game; the Red Yoshi Kid has to decline Dane T. and Mini T.'s offer to go to Toad Town but has Mario and Parakarry deliver a Letter to the two. Additionally, a Letter found on Lavalava Island and addressed to Russ T. was apparently written by one of the island's Yoshi Kids, presumably a member of the Fearsome 5. The Fearsome 5 also write to Mario himself at a certain point in the game. During Paper Mario's ending sequence, the Fearsome 5 are seen up to their mischief yet again, having returned to Jade Jungle and being yelled at by Sushie, who received an invitation to Princess Peach's Castle from Parakarry shortly after. The green Yoshi kid of the Fearsome 5 also served as an invitee to the party at Peach's Castle, and all of the Fearsome 5's members were present in the ending parade, where they partially devoured Huff N. Puff and his Tuff Puffs, shocking them and disappointing a hungry Gourmet Guy, who had seemingly planned to do the same thing. 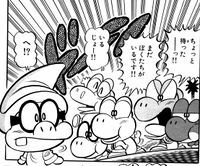 In volume 26 of Super Mario-Kun, Mario and his partners first find the Fearsome 5 sleeping. Mario carries one while he has Kooper carrying the rest much to Kooper's complaint. When Putrid Piranhas and a White Magikoopa attacks Mario, Goombario, and Kooper, the Fearsome 5 awakes and helps them. They tape the Putrid Piranha's mouths shut while using a Thunder Rage on the White Magikoopa. Mario and his partners then take the Fearsome 5 home. He's a yellow Yoshi kid. Whoa! He's cheery, huh? This kid is full of pep. I was the same back in the days when I was small. What? I'm still small? Well, yeah, compared to you, I guess I'm still wet behind the ears. He's a green Yoshi kid. He's an excitable rascal, huh? Yoshi kids get pretty big. All he wants to do is explore beyond his village. I know how he feels. He's a purple Yoshi kid. Not a care in the world! Very cute. He seems to like you, Mario. He's a blue Yoshi kid. He thinks he's different from other Yoshi kids. What a cute little guy! I can see how he might get on your nerves, though. Yoshi kids are so cheerful. This red Yoshi kid, though, looks pretty mischievous. He looks like a little scamp. I bet he gets into all sorts of trouble and doesn't regret it a bit. What? That's like me? Marioooo! C'mon! Take it back! This page was last edited on April 1, 2019, at 00:56.